Registration in advance by E-mail. Fill in the registration form (20thRegistrationForm.xls) and E-mail it to the secretariat (symp ) . ※ When you do not receive a reply E-mail within three business days, please contact the secretariat. If you would like to make a poster presentation at the symposium, please fill in the title of your poster presentation. 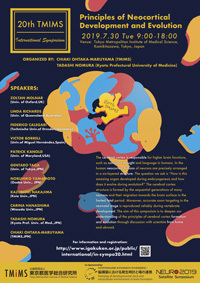 Up to 30 posters can be presented. If there are so many requests we might not be able to meet your request. The poster size is a maximum of 841mm wide x 1189mm high. All poster presentations are conducted in English. We accept the title is a tentative one. You can modify it later. Posters should be displayed and collected by yourself.